Erman Çetiner has so far won around 100 medals, including a third place finish at the world championship for Down syndrome players. 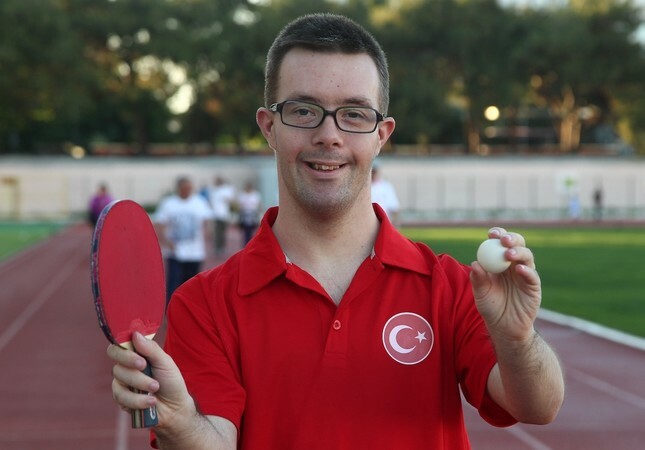 A Turkish table tennis player with Down syndrome is keen to become the country's first gold medal winner at this year's world championship. Erman Çetiner, 30, who works as a tea runner at the Kırklareli governor's office, has so far won around 100 medals, including a third place finish at the world championship for Down syndrome players. In October 2017, Çetiner will compete at the International Down Syndrome Championship in Portugal. His coach believes he will bring the world championship title for his country. Çetiner, a "medal hunter", met his coach Soner Polat 12 years ago, and since then he has been playing table tennis. Çetiner told Anadolu Agency (AA) he believes that he will overcome all obstacles with the help of table tennis. "My coach Soner allowed me to hold on to life with the help of table tennis. Right now, I am playing with Down syndrome on the national team and I will wave our flag, its star and crescent, on our national team jersey all around the world," he said. His coach says Çetiner won his first medal two years after he began playing table tennis and since then he has not lost. "Çetiner became the Marmara region champion 10 times," Polat said. "He became Turkey's champion and later he represented the Turkish national team in South Africa, where the team finished fifth." The duo works six days a week for three hours a day.